ANYbotics is ICRA 2018 Robot Launch Champion – LET'S TALK ROBOTS! The four-legged design of ANYmal allows the robot to conquer difficult terrain such as gravel, sand, and snow. Photo credit: ETH Zurich / Andreas Eggenberger. ANYbotics led the way in the ICRA 2018 Robot Launch Startup Competition on May 22, 2018 at the Brisbane Conference Center in Australia. Although ANYbotics pitched last out of the 10 startups presenting, they clearly won over the judges and audience. As competition winners, ANYbotics received a $3,000 prize from QUT bluebox, Australia’s robotics accelerator (currently taking applications for 2018! ), plus Silicon Valley Robotics membership and mentoring from The Robotics Hub. ANYbotics is a Swiss startup creating fabulous four legged robots like ANYmal and the core component, the ANYdrive highly integrated modular robotic joint actuator. Founded in 2016 by a group of ETH Zurich engineers, ANYbotics is a spin-off company of the Robotic Systems Lab (RSL), ETH Zurich. ANYmal moves and operates autonomously in challenging terrain and interacts safely with the environment. As a multi-purpose robot platform, it is applicable on industrial indoor or outdoor sites for inspection and manipulation tasks, in natural terrain or debris areas for search and rescue tasks, or on stage for animation and entertainment. Its four legs allow the robot to crawl, walk, run, dance, jump, climb, carry — whatever the task requires. Motor, gear, titanium spring, sensors, and motor electronics are incorporated in a compact and sealed (IP67) unit and connected by a EtherCAT and power bus. With ANYdrive joint actuators, any kinematic structure such as a robot arm or leg can be built without additional bearings, encoders or power electronics. ANYdrive’s innovative design allows for highly dynamic movements and collision maneuvers without damage from impulsive contact forces, and at the same time for highly sensitive force controlled interaction with the environment. This is of special interest for robots that should interact with humans, such as collaborative and mobile robots. 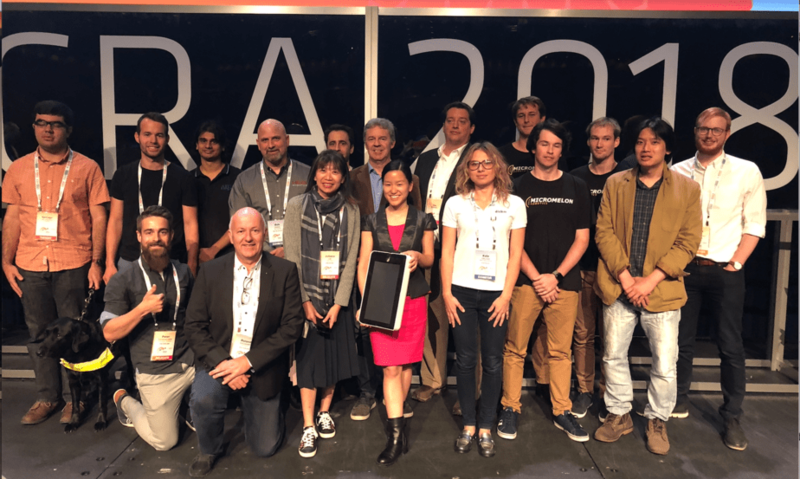 ICRA 2018 finalists and judges; Roland Siegwart from ETH Zurich, Juliana Lim from SGInnovate, Yotam Rosenbaum from QUT bluebox, Martin Duursma from Main Sequence Ventures and Chris Moehle from The Robotics Hub Fund. 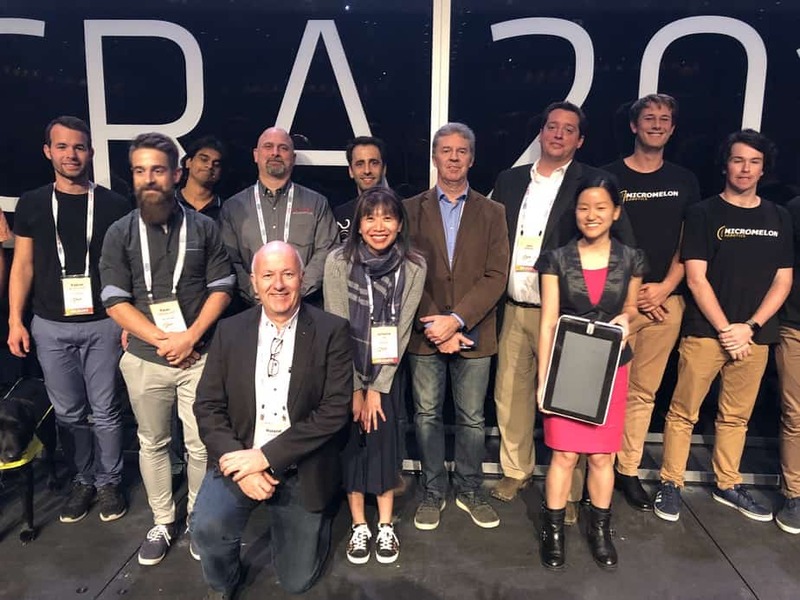 The ICRA 2018 Robot Launch Startup Competition was judged by experienced roboticists, investors and entrepreneurs. Roland Siegwart is a Professor at ETH Zurich’s Autonomous Systems Lab and cofounder of many successful robotics spinouts. Juliana Lim is Head of Talent from SGInnovate, a Singapore venture capital arm specializing in pre-seed, seed, startup, early-stage, and Series A investments in deep technologies, starting with artificial intelligence (AI) and robotics. Yotam Rosenbaum is the ICT Entrepreneur in Residence at QUT bluebox, building on successful exits from global startups. Martin Duursma is a venture partner in Main Sequence Ventures, Australia’s new innovation fund specializing in AI, robotics and deep tech like biotech, quantum computing and the space industry. Chris Moehle is the managing partner at The Robotics Hub Fund, who may invest up to $250,000 in the overall winner of the Robot Launch Startup Competition 2018. Purple Robotics creates drones for work, which fly for 3x longer than, or carry 3x the payload of existing commercial drones, due to their innovative design. They are not standard quadrocopters but they use the same battery technology. Purple Robotics drones are also gust resistant, providing maximum stability in the air and enabling them to fly closer to structures. Micromelon creates a seamless integration between visual and text coding, with the ability to translate between the two languages in real time. Students and teachers are able to quickly begin programming the wireless robots. The teacher dashboard and software are designed to work together to assist teachers who may have minimal experience in coding, to instruct a class of students through the transition. Students are able to backtrack to blocks, see how the program looks as text or view both views at once students are able to be supported throughout the entire journey. EXGwear is currently developing a “hands-free”, intuitive interaction method, in the form of a portable wearable device that is extremely compact, non-obtrusive, and comfortable to wear long hours to help disabled people solve their daily interaction problems with the environment. Our first product, EXGbuds, a customizable earbud-like device is based on patent-pending biosensing technology and machine learning-enabled App. It can measure eye movement and facial expression physiological signals at extremely high accuracy to generate user-specific actionable commands for seamless interaction with the smart IoTs and robotic devices. HEBI Robotics produces Lego-like robotic building blocks. Our platform consists of hardware and software that make it easy to design, build and program world class robotics quickly. Our hardware platform is robust, flexible, and safe. Our cross-platform software development tools take care of the difficult math that’s required to develop a robot so that the roboticist can focus on the creative aspects of robot design. Abyss Solutions delivers key innovations in Remotely Operated Vehicles (ROVs) and sensor technology to collect high fidelity, multi-modal data comprehensively across underwater inspections. By pushing the state-of-the-art in machine learning and data analytics, accurate and efficient condition assessments can be conducted and used to build an asset database. The database is able to grow over repeat inspection and the objectivity of the analytics enables automated change tracking. The output is a comprehensive asset representation that can enable efficient risk management for critical infrastructure. EyeSyght is TV for your fingers. As humans we use our senses to gather and collect information to analyse the environment around us and create a mental picture of our surroundings. But what about touch? When we operate our smartphones, tablets and computers we interact with a flat piece of glass. Now through the use of Haptic Feedback, Electrical Impulses, Ultra Sound, EyeSyght will enable any surface to render Shapes, Textures, Depth, and much much more. Niska Retail Robotics is reimagining retail, starting with icecream. “Customer demands are shifting away from products and towards services and experiences.” (CSIRO, 2017) Niska creates wonderful customer experiences with robot servers scooping out delicious gourmet icecream for you, 24/7. Aubot (‘au’ is to meet in Japanese – pronounced “our-bot”) is focused on building robots that help us in our everyday lives. The company was founded in April 2013 by Marita Cheng, Young Australian of the Year 2012. Our first product, Teleport, is a telepresence robot. Teleport will reduce people’s need to travel while allowing them greater freedom to explore new surroundings. In the future, aubot aims to combine Jeva and Teleport to create a telepresence robot with an arm attached. Sevensense (still based at ETH Zurich Autonomous Systems Lab) provide a visual localization system tailored to the needs of professional service robots. The use of cameras instead of laser rangefinders enables our product to perform more reliably, particularly in dynamic and geometrically ambiguous environments, and allows for a cost advantage. In addition, we offer market specific application modules along with the engineering services to successfully apply our product on the customer’s machinery. We thank all the startups for sharing their pitches with us – the main hall at ICRA was packed and we look forward to hearing from more startups in the next rounds of Robot Launch 2018.